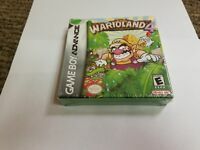 This innovative action game uses a motion sensor, built in to the cartridge, that allows players to tilt the entire game world by tilting the GBA handheld itself. By turning the GBA on its side, players can rotate all of Yoshi Island, causing objects to tumble, pendulums to swing, and bad guys to fall over. An onscreen meter displays the current orientation of the handheld (and game world), helping players to keep their bearings throughout the topsy-carefully turvy gameplay. 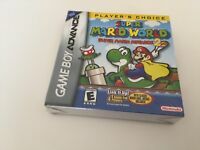 As in many of the classic games starring Mario and his friends, this platform adventure allows players to collect coins and race to ends of the levels for high scores, or explore the nooks and crannies of each area to discover hidden bonuses and useful secrets. Cute game. Strange story line. I love that its about yoshi because the person I got it for is crazy about yoshi. I do like the motion sensor, it adds more movement to the game. It helps her learn better problem solving skills. Instead of just running and jumping through a course she has to stop when she comes to a wall and remember to tilt the game sideways to help yoshi run up. Or tilt it to see a carpet unroll to cover a gap yoshi wouldnt be able to jump over himself. I even liked this game myself. Then again, I am still facinated by the wii. The story line is a bit odd but no big deal. After all, Mario bros. is a game made by a Japanese company about two Italian plumbers who fight lizards, turtles and bombs (among other things) to save a princess who cant seem to keep from getting captured... I guess Yoshi Topsy Turvy isnt that strange. Yoshi Topsy-Turvy for Game Boy Advance is a fun,interesting game with a new concept tilting the gameboy. Overall the game is great with well thought out ways to make you tilt the gameboy to get to the goal. It was aimed at younger players but as an adult I enjoyed it as well. It was a quite a bit easier then Yoshis Island to plow through and get all silver but you can make it a much more challenging game by going back through and attempting to get all gold. Great Game! Fun to play. I really enjoy how in this game you have to tilt the system while you play. It adds an extra challenge to the game, and makes it more interactive. The tilting takes getting used to and makes it difficult to play at first, but once you to get into the game, it gets pretty easy. I recommend this game to anyone likes fun, colorful, Nintendo games. I decided to buy the product because I love Yoshi and the thought of a world where everything turns by turning the console just intrigued me. I had to give it a try. As soon as I got it I tore open the package and inserted the game into my console and began playing. It was everything I had hoped it would be. I love the little twists and turns in the game. Some might say this is a game for little kids but this is one "big kid" that is having a lot of fun playing it. 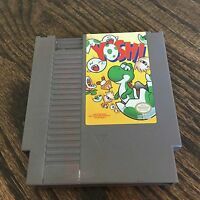 I am so glad I took a chance and got this Yoshi Topsy Turvy game. I LOVE the tilt sensor in this game. It is really cool! I was afraid that it would be hard to work, but it is not. 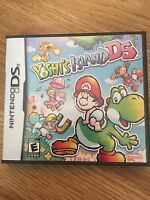 All of the Yoshi's Island games are fun, but the tilt sensor made this game the best! This is my favorite Game Boy Advance game that I have ever played (and I have played a lot).